With bittersweet timing, the government has closed its doors on Yosemite’s “birthday” as a national park (which should rightfully be called Ahwahneechee National Park had a historian been involved in determining the proper name of the local native peoples who lived here). This is a place very dear to my heart. A place where we as a family can experience excitement, being humble, and being alive. The act of designating national parks and protected areas is arguably one of the greatest accomplishments of the US government. That said, these areas do need regular funding to maintain safe access, steward important resources, and provide user experiences that will increase ones interest in the park, its resources, and history. Staff and volunteers are an essential element of any park – whether you see them or not. Even information is on furlough? In a way, I’m somewhat happy the critters, rivers and air of Yosemite will get to celebrate their “designation” in relative silence. A quiet birthday. Meanwhile, maybe this closure will increase our interest in protecting and funding these areas with appropriate staff and funding. 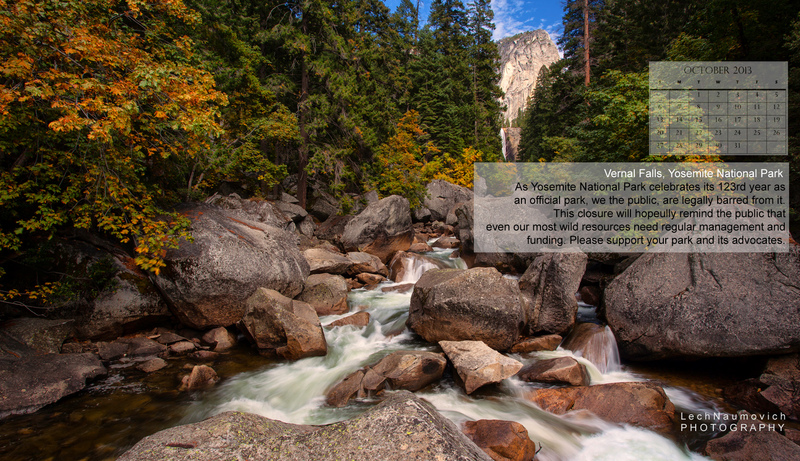 Although this government shutdown isn’t about Yosemite and parks (in particular) – the furlough is about the general idea of how (and if) to fund public goods and services so that we can enjoy equal access to many of the most treasured places and services that are uniquely American – whether it be schools, rivers, mountainsides, hospitals or shelters. I think it’s a no brainer. But then again – I’m not well suited for government. Freeze-action photo of Bridalveil Fall in full spring glory. 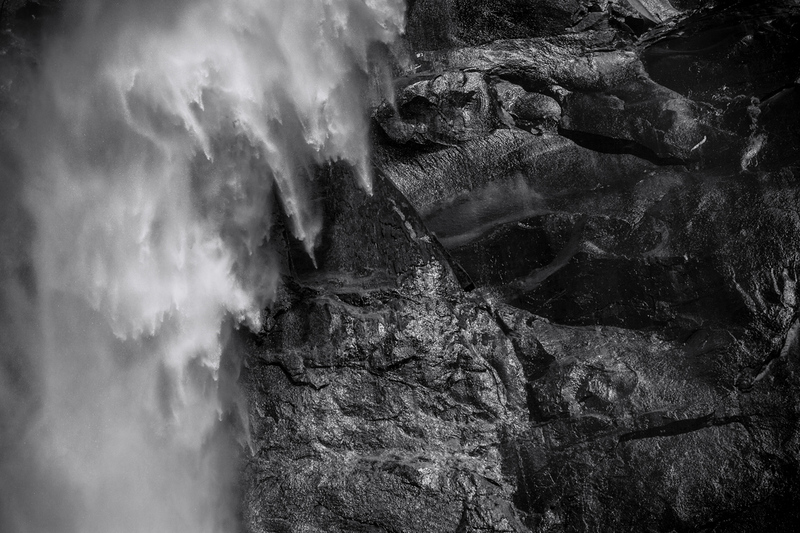 Here’s my tribute to Yosemite – a desktop calendar October – free for all who want to use it as a calendar. Thanks for the insight… NP’s are a real treasure and one we should all find a way to support. Thanks Bucko! 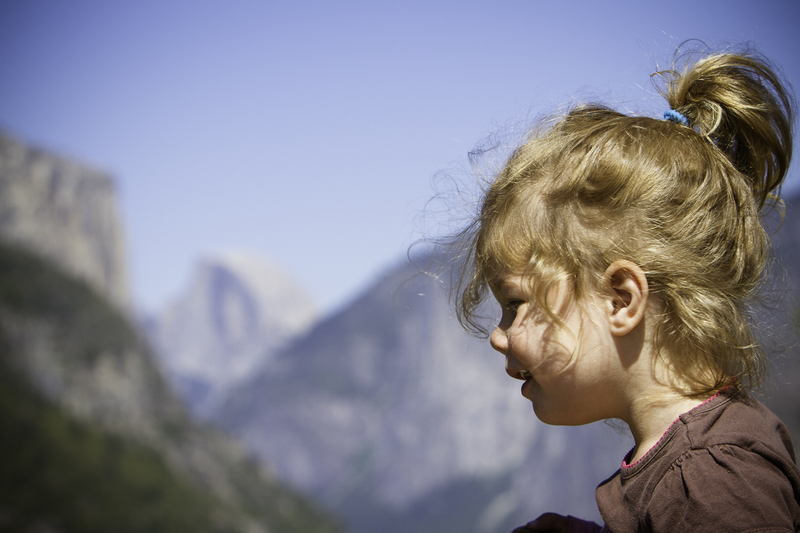 I think there are some great foundations that support Parks and I know that in particular the Yosemite Conservancy – http://www.yosemiteconservancy.org/ & the Yosemite Fund – http://www.yosemiteconservancy.org/ – have helped extend the capacity of federal dollars. I certainly appreciate funding of private-public partnerships for instances just like this shutdown.